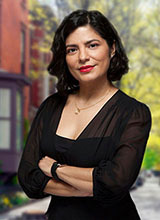 Vanessa’s deep understanding for how conducive one’s own home is to one’s well being, is what drives her passion for real estate. Always a prodigious traveler, Vanessa has developed a keen eye for what is important to people in maintaining a happy home life. “Meeting, mingling and helping people - that’s what makes me tick!” This is why translating her client’s wishes into the best possible match is essential to her process as an agent. Vanessa’s experience in sales developed from another passion of hers- wine. In her twenties, she astutely picked up a wine encyclopedia and never looked back, building a career in the wine industry. She worked and honed her skills (and palate, of course) in all aspects of the field- traveling through vineyards, conducting wine tasting events, selling wine in shops as well as Michelin rated restaurants and many prestigious hotels. Before becoming a Real Estate Agent, her affinity for people, travel and entrepreneurial pursuit, led her to create a Mayan Women’s textile initiative in her country of birth, Guatemala. This venture took her through many small villages in the highlands where she cultivated relationships with many talented indigenous women. The outcome was a business cooperative, with the women entrusting Vanessa with their most precious creations in order to introduce them to the world. Twenty-odd years ago, her passion for experiencing a myriad of cultures led her to Manhattan. She has been a New Yawka ever since, living between the Upper Westside and Harlem- where she currently resides. Please reach out to Vanessa, if you are interested in buying, selling, renting, or investing. She will bring her skills, passion, and everything it takes to fulfill your real estate needs.